Belly up to one of America's top bars, located in Gem Village, Colorado. Enjoy the iconic dive bar, replete with cold beer, live music, and great food from the Roadhouse. Fort Lewis College Athletics’ strives to provide fans who attend Skyhawk events a home where they can enjoy college athletics at their best. Experience a thrilling adventure together with your family, soaring from tree top to tree top. Located on Hwy 160 just one mile West of Downtown Durango. Horsefly History Tours provides the ultimate guided walking experience of Historic Downtown Durango with the help of multi-generational stories. Authentic Mexican food, made fresh and fast with cantina pride! 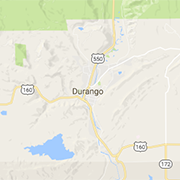 Visit us at either of our convenient Durango locations. A perfect destination for any motorcycle aficionado searching for live music, great events, food and drinks. Durango's Authority on Native American Art & jewelry, specializing in Navajo rugs & weavings. We also carry museum quality Southwestern fine art.